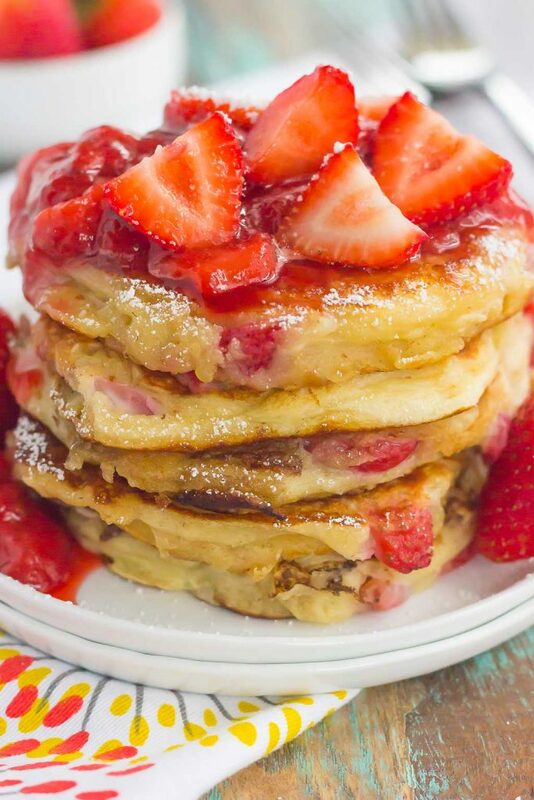 These Strawberry Greek Yogurt Pancakes are thick, fluffy, and loaded with juicy strawberries in every bite. 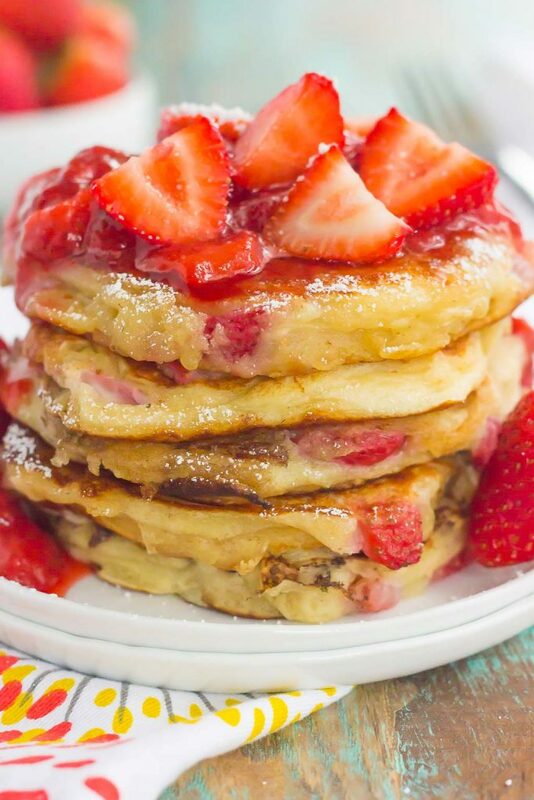 Made with Greek yogurt for a healthier twist and topped with an easy strawberry sauce, you’re going to fall in love with the sweet taste of these pancakes! I’ve said that before, and I’ll probably continue to keep saying that. But, let me clarify. While I do love cereal, oatmeal, toast, etc…all my usual breakfast foods, it’s my favorite meal when it involves something like frittatas, overnight oats, french toast bakes, and pancakes. Not just plain ‘ole cereal or toast with jelly. Since I’m not the best at eating a regular breakfast (mine usually consists of yogurt or cereal and coffee), I love to whip up a more savory breakfast on the weekends. And that’s where these Strawberry Greek Yogurt Pancakes come into play. See, I do love pancakes, but I have to be in the mood for them. Whenever I go out to breakfast, I usually get some sort of skillet with eggs and hash browns, or an omelet, or something along those lines. The hubster, though, he loves his eggs with a side of pancakes. And when I see those pancakes, my cravings kick in. Now, you may remember these Blueberry Greek Yogurt Pancakes from almost two years ago. 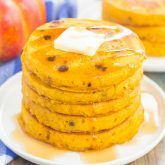 These quickly became one of the most popular recipes on Pumpkin ‘N Spice, and for good reason! Soft, thick, fluffy, and on the healthier side. That’s a winning pancake in my opinion! So, it was time to revamp my old favorite into my new favorite kind of pancake! If you’re on board the pancake train all the time, then you need to try these Strawberry Greek Yogurt Pancakes. What I love about these are the thick and fluffy texture. I dare you to find a thicker, softer, homemade pancake. And the Greek yogurt. Let’s not forget about that! I love sneaking it into dishes for a healthier alternative to sour cream. And with these pancakes, it helps with the thickness and soft texture. And last, but certainly not least, the strawberries. 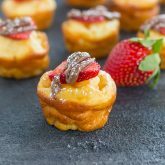 Loaded with juicy strawberries and topped with a strawberry glaze, you really can’t get much better than that. These pancakes re thick! The cooking time may take slightly longer than regular pancakes because of the thick texture. Fresh or frozen strawberries work perfectly for these pancakes. Save those leftovers! These pancakes make a delicious breakfast (or dinner) later in the week. 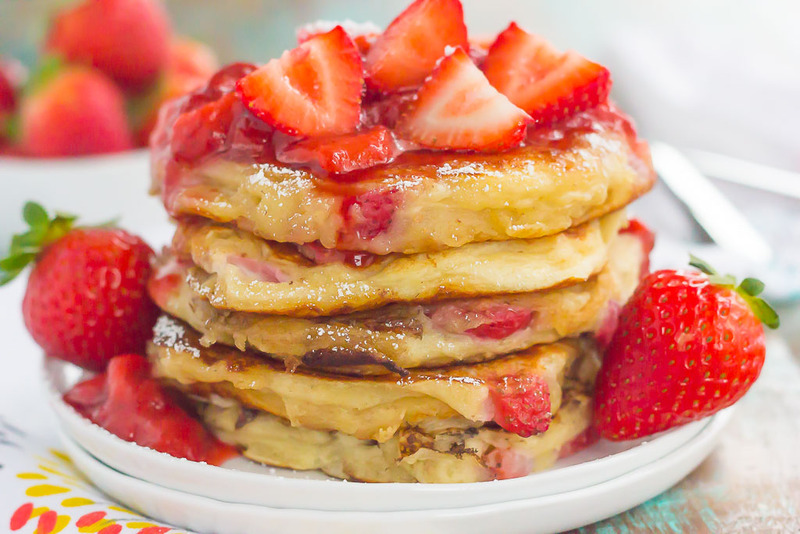 So grab those ingredients and whip up a batch of these Strawberry Greek Yogurt Pancakes today! 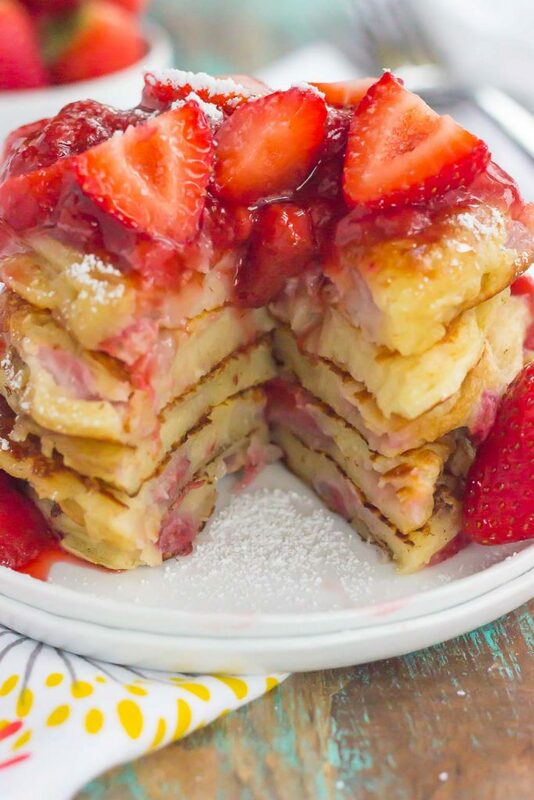 These Strawberry Greek Yogurt Pancakes are thick, fluffy, and loaded with juicy strawberries in every bite. 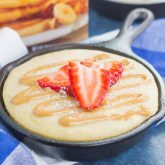 Made with Greek yogurt for a healthier twist and topped with an easy strawberry sauce, you're going to fall in love with the sweet taste of these pancakes! In a medium bowl, whisk together yogurt, egg, milk, and vanilla extract. While the pancakes are cooking, prepare strawberry sauce (can also be made ahead of time). Combine the strawberries, water, sugar, and vanilla into a medium pot. Bring mixture to a boil, then cover and simmer until soft and thick, about 15 minutes. Pour sauce over pancakes when ready to serve. I love breakfast too, especially on the weekend when I have more time in the morning. I know what you mean about when you see them, you want them. Funny thing, isn't it? It would be hard to resist these for sure with the strawberry addition. These aren't no average pancakes :) These look perfect for Saturday morning with a bucket of coffee and I just love the Greek yogurt in there. What a great way to add more flavour, moistness and protein. Pinned, of course. Have an awesome weekend, my friend! Isn't it funny how our mind works? I usually only get pancake cravings when my husband eats them! :) And I love how you would have these with a bucket of coffee...my kind of breakfast! Thanks for the kind words and pin, friend! Happy weekend to you, too! We love big breakfasts on the weekends and pancakes are always a family favorite...especially when Hubby makes them! And they're always best when fruit is involved! I love how delicious these look, Gayle! I can almost taste them! Have a great weekend, my friend! Thanks, Annie! Pancakes are the best on the weekends! :) Hope you have a wonderful weekend, too! Hands down, breakfast is my favorite meal as well, but that doesn't include boring breakfasts, like cereal or toast. Pass. ;) Poached eggs, frittatas, waffles, french toast, and PANCAKES. OMG, I LOVE LOVE LOVE! I'm not going to lie, when I saw the first picture of these fabulous pancakes I thought, "is she trying to torture me?!" These look AMAZING, Gayle!!!! Serious drool is happening over here! I love the strawberries and I loooove that you lightened these up with greek yogurt!! Now I want to stop everything I'm doing and go whip up a few batches of these breakfast beauties! Pinned! Cheers, girlfriend! Yay for being breakfast twins! How did you know I was trying to torture you? :) Pancakes are a special treat in my house, but when I make them, I love to include fresh fruit and make them has FLUFFY as possible! Thanks for the sweet comment and pin, friend! Oh, YES! I could definitely dive into that stack of pancakes. Love the strawberries piled on top! So much deliciousness. Wish I had these for breakfast! Thanks, Rachel! These pancakes make the BEST breakfast! Love breakfast and these pancakes look so delicious! I haven't made pancakes in a while! Can't wait to try these! I love breakfast too, but I'm pretty plain Jane about it most of the time. I have to be in the mood for pancakes too, and when I am there's no substitute! I love Greek yogurt pancakes, and these look just amazing -- they're so thick and fluffy! That strawberry topping is making me crave spring in a big way too. These look delicious! Yes! Eating with your eyes definitely hits the spot when it comes to pancakes. Hope you have a great weekend, too! Breakfast is by far my favorite meal of the day too! I love it all, and these thick pancakes might have to go at the top of my weekend list! They sound amazing! I crazily enough, have never had Greek Yogurt before in my life. #dairyallergy - WOMP WOMP! Sorry to hear that, Gigi! I can't even STAND how ultra-thick and fluffy these look, Gayle! Seriously, I just want to dig into that entire stack with my face! This is total weekend material that I've GOT to make asap! These are pretty as a picture and look perfectly balanced in terms of flavor: a bit sweet, a bit tangy, a bit carb-y. That is to say, the best! Thanks for the pancake love! Breakfast is my favorite meal of the day too! I wish I had this stack of pancakes for breakfast today, looks amazing!! Thanks for the pancake love, Manali! I agree, Nicole...homemade is definitely better. soooooo fluffy (heart eye emoji) I'm a huge breakfast person, and I can't just down a bowl of cereal and go. I need something filling since I don't usually eat lunch. These sound like a wonderful lazy Sunday morning breakfast. Thanks, Annie! I agree, definitely a perfect Sunday breakfast! Breakfast is my favorite especially when pretty pancakes like these are involved :) I would love to wake up to a giant stack of these this morning! The strawberry topping and greek yogurt are perfect in here! I love your thinking, Kate! Thanks! Hi, Gayle! 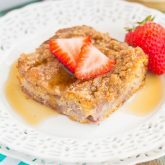 I am finding a recipe relating to strawberry because I love it so much! Your strawberry greek yogurt pancakes look so yummy. I will try soon. Thanks for your sharing! Thanks for the kind words and for stopping by, Salina! I hope you love these pancakes, they're a favorite of mine! I'm so glad you liked them, Renata!